Nicky Egan will release the first of her upcoming digital 45's, "Made A Fool Of Me"/"I Tried", on July 30. 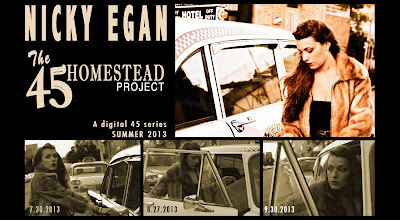 Soulful powerhouse singer/songwriter NICKY EGAN announced a collection of new material titled The 45 Homestead Project today. The unique series will be comprised of three “digital 45’s” that will be released over a three-month span. Each “digital 45” will have an A/B side with a music video accompanying each A side track and a live performance at the Rockwood Music Hall in New York City. At the end of the third release, the singles will be combined to create one complete 7 song EP that will include an unreleased bonus track. The structure is designed to resemble the old soul-music model of releasing single 7” records with a modern visual twist. The first release, which is set for July 30, will feature the single ‘Made A Fool Of Me’, which evokes the spirit of 1960’s era soul legends, and the jazz tinged B side ‘I Tried.’ The following releases are set for August 27 and September 30. Each of the accompanying videos will be released on the same day simultaneously. All three videos are directed and produced by Little Lou Productions with Thin Edge Films contributing to the September video release. Tour dates for the digital 45 release shows are below.